Thorin and his company of dwarves might have hoped for a peaceful journey, but they certainly did not embark on a journey to the Lonely Mountain without the proper arms to defend themselves. Here you will find their weapons as well as the memorable arms of other characters from Middle-earth, all recreated for your viewing and owning pleasure. Now you can own your favorite weapon that you saw used against the vilest denizens of Middle-earth. 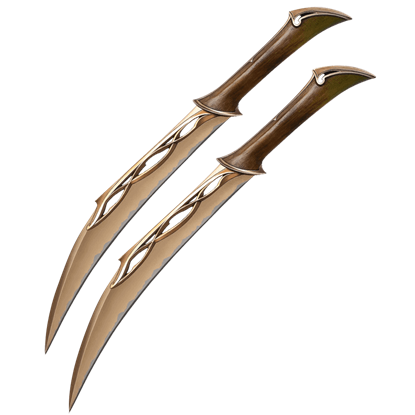 Orcrist, the legendary Elvish blade that Thorin claimed for himself, can be yours, and with it comes the same elvish look and feel that really makes the blade look like a peerless piece of elven bladework. 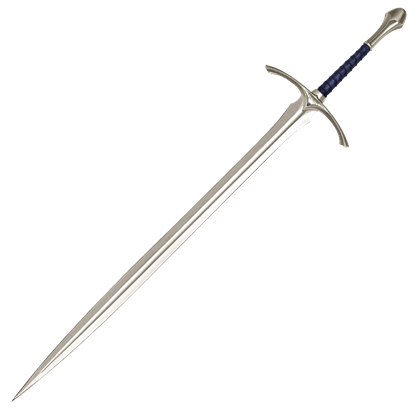 Of course, we also offer Sting, the blade that Bilbo Baggins acquires around the same time that Thorin claims Orcrist and Gandalf claims Glamdring (which is also available here). Each of the blades, axes, and staves that you will find here are made from the finest materials, and each one is made to look like its on-screen replica (which in turn is designed to resemble the swords as they were described in the books that they are featured in). And more than just swords from the Hobbit, you will also find swords from the Lord of the Rings trilogy here, too, allowing you to own the arms of the warriors who came later! 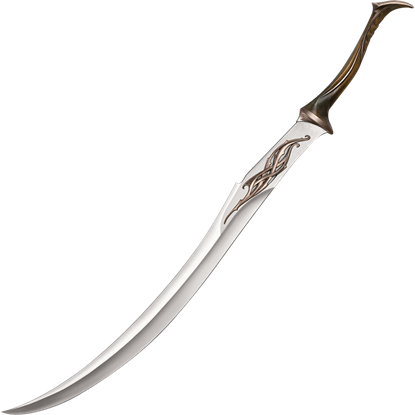 As far as Hobbit collectibles go, very little can compete with the look and feel of an awesome weapon, and those are exactly what you will find here when you take a look at our The Hobbit Swords section. 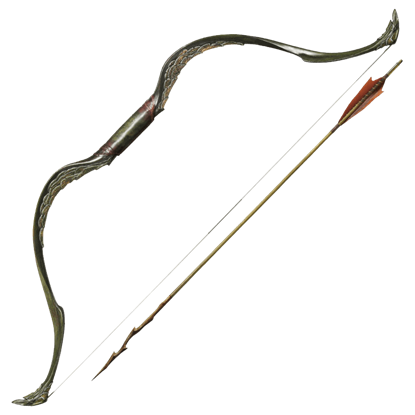 Naturally lithe and graceful with a gift for dexterity and far-sight, it should come as no surprise that many elves favor the bow. Among their best is Tauriel, who acts as captain of the woodland guard of King Thranduil. Tauriel may only seem to be a common wood elf, but her skills make her anything but. 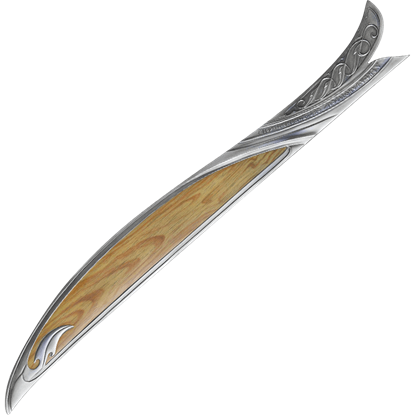 Her preferred melee weapon is double daggers, whose unique design boasts a fine look to mark her as a ranked warrior within the court. 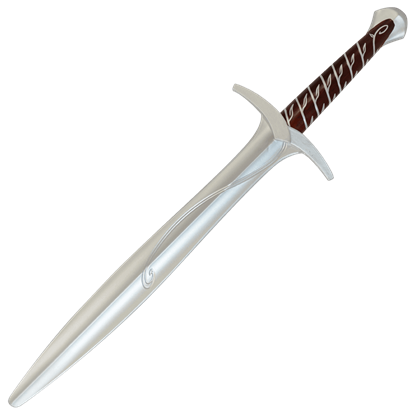 This replica of Glamdring, the sword of Gandalf the Wizard, has been painstakingly and meticulously recreated to bring you the blade that a wise and powerful figure who led two hobbits into a world of heroics and adventure. Anyone who has ever wanted to be just like Gandalf is sure to love this special edition of his iconic staff! The Illuminated Staff of Gandalf features a crown that glows just like the one seen in The Hobbit The Desolation of Smaug. 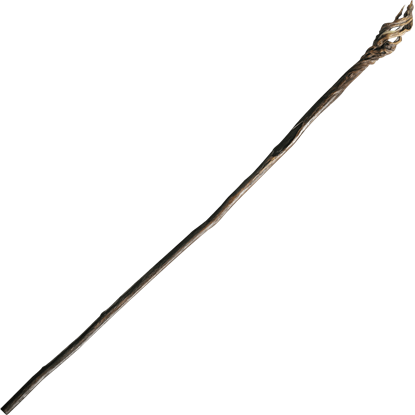 This vile mace was thought to have been destroyed in a great battle between orcs and dwarves, but it was not. 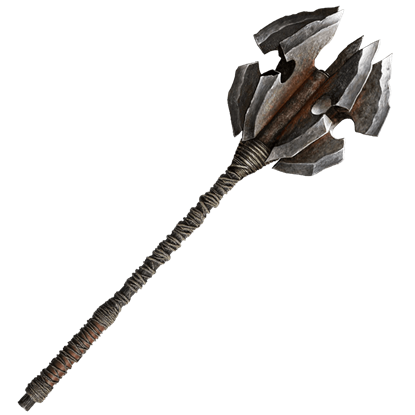 The Mace of Azog the Defiler lived on, as did its wielder, and now they come forth to hunt the hated dwarf company. The woodland guard of Mirkwood is sworn to protect the woodland realm, and they are armed to fight in the open expanses of the woods and the royal halls. 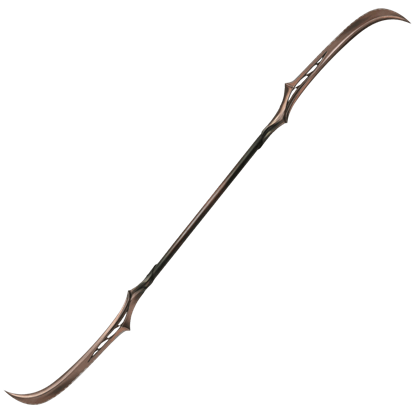 In their hands, the Mirkwood Double-Bladed Polearm is a devastating weapon. Sworn to protect the forest of Mirkwood, Silvan Elves are known to be lethal warriors with an expertise in the use of bows and swords. 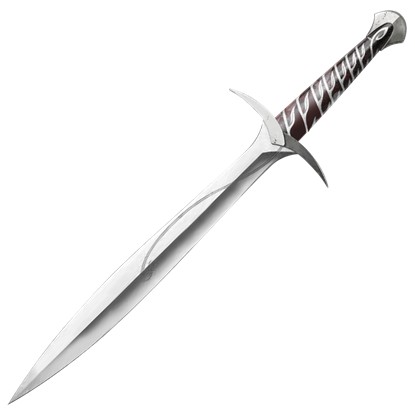 The Mirkwood Infantry Sword is a stunning display sword designed after a weapon from The Hobbit. The Orcrist Scabbard is an authentically detailed Hobbit collectible and a reproduction of the actual filming prop. This Hobbit sword sheath is crafted from polyresin with a metal and wood grain patterned finish. This replica of Orcrist, the sword of Thorin Oakenshield, has been painstakingly and meticulously recreated to bring you the blade that eventually came into the hands of a steadfast dwarf who ensured that the blade lived up to its name. This replica of Sting, the Sword of Bilbo Baggins, has been painstakingly and meticulously recreated to bring you the elven blade that found its way into the hands of a hobbit, who would go on to use it on his grand adventures. 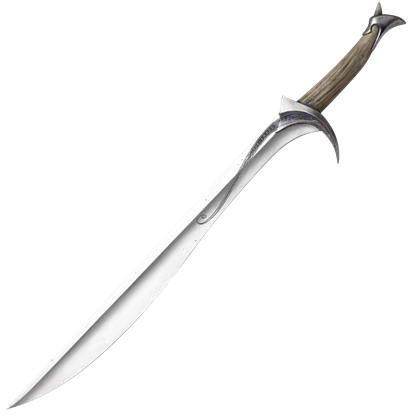 Like many of the elven weapons of Gondolin, Sting had magic woven into its steel. 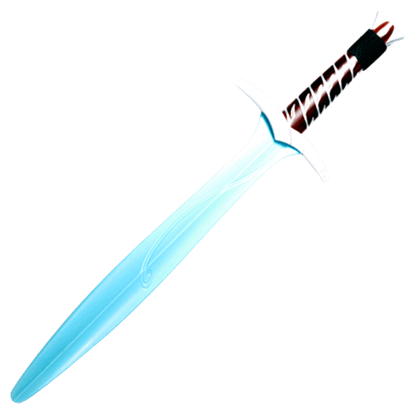 The swords blade was said to glow with blue light when orcs and goblins were near, warning the wielder to be cautious, as danger was near. Every good adventurer should carry a weapon, lest of all they face doom on the road. This was, perhaps, what motivated Gandalf to hand the young hobbit an elvish short sword named Sting when they discovered treasure in a troll lair.